Sahil is a student aspiring to get admission to an engineering institute, but finds it difficult to understand science. Then his father undertakes the task of helping him, and in the process, finds himself contemplating on the reasoning of origin of Matter and the Universe. He develops an interest to find out how everything in the Universe originated. Big-Bang theory of Origin of Universe does not seem convincing to him. So, he continues his quest and contemplation further, and explores the possibility of creation of Universe from Space in some other manner. He finds very interesting connections in some invisible medium of space and various aspects of physics. Though, he provides elucidation to Sahil on the predominant theories of science, yet he secretly keeps working on his own idea of invisible medium of space, where, he is necessitated to part ways with the prevailing theories. 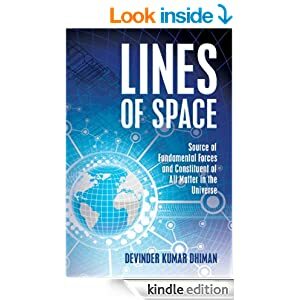 He named this medium as ‘Lines of Space’ and un-intimidated by the deep-rooted theories of renowned scientists, he delves into a new arena, giving an entirely new and different derivation to gravitation and theory of relativity. Based on his new formulation, he submits a paradigm modification in the structure of matter and puts forward the explanation, how universe got created from space itself. This notion is presented in a very interesting manner, with the help of various illustrations, to make it easy to understand by everyone.